The poetry reading in Canada developed into an increasingly important form of literary expression in the 1950s, 1960s, and 1970s alongside the development of literary publishing in Canada, the teaching of Canadian literature in university English departments, and the establishment of the Canada Council for the Arts. Poetry readings gained a foothold in the literary imagination of cultural agents in Canada with a scope and intensity akin to the explosion of little magazines and small presses in these same decades. This occurred, in part, due to the relationship of poetry readings, as a specific form of cultural production, to the nationalist interventions of the Canada Council. Yet this relationship was a fraught one, not unlike the relationships writers and publishing houses had with the Canada Council. Jason Camlot and Darren Wershler, in their working paper “Theses on Discerning the Reading Series,”1 call for approaches to studying poetry readings predicated on “an historical understanding of the place of different reading practices in relation to historical conceptions of the literary.”2 The emergence of the Canada Council framed conceptions of the “literary” in liberating and restricting ways in these decades, codifying various literary categories based on the eligibility requirements of evolving categories of funding (malleable and responsive at first, ordered and constricting in later years). The myriad forces that nurtured the aesthetic development of Canada’s literary fields in the decades following the Second World War have been documented and studied by critics for years now, with complex networks of national and international influence traced and contested.3 The intervention of the Canada Council was germane to these networks on a material level. Council funding provided the literal means necessary for many of Canada’s cultural agents to pursue their projects (I use “agents” here, and throughout the paper, in relation to Pierre Bourdieu’s theory of the field of cultural production in order to encompass writers as well as editors, publishers, event-organizers, critics, and other actors within the field). The Canada Council for the Arts is a Canadian Crown Corporation founded in 1957. It supports and promotes the production of Canadian art in a variety of fields (visual arts, media arts, dance, music, theatre, writing, and publishing) through funding to artists and arts organizations. It was created based on the recommendations of the Massey Commission Report of the Royal Commission on National Development in the Arts, Letters and Sciences 1949–1951 (1951), a foundational document in the forging of the nationalist links between the Canadian Government and the production of art in Canada. The Massey Report was commissioned by the Government of Canada based on the belief that it was “desirable that the Canadian people should know as much as possible about their country, its history and traditions; and about their national life and common achievements.”4 The Government felt it was “in the national interest to give encouragement to institutions which express national feeling, promote common understanding and add to the variety and richness of Canadian life.”5 Among numerous recommendations, the Report proposed establishing the Canada Council as well as founding a National Library (something Canada did not have until 1953, and a direct result of the Report’s recommendation). Since 1957, the Canada Council has acquired a central place in supporting the production, dissemination, and reception of Canadian art, both by funding artists directly and through the development of structures that distribute and preserve work. It was not (and still is not) without critics of the tension between centralized government support and marginal, ostensibly oppositional artistic practice (tensions that will be discussed in greater detail shortly), but it nonetheless provided (and provides) material financial support necessary to the current state of Canadian arts and letters. Ken Norris, in his study of the rise of the little magazine in Canada, cites the financial aid provided by the Canada Council as a vital new resource that enabled the rapid proliferation of magazines across the country.6 Karl Siegler, editor of Vancouver-based small press Talonbooks from 1974–2007, makes a similar yet conflicted case for the interventions of the Council from the mid–1960s on: “In the intervening thirty years, we did, in fact, create a vibrant, post-colonial Canadian literature and culture of our own […]. And how did we do that? The way all struggles of liberation, the re-inscription of the self and the other, are carried out. Through sweat equity, and a great deal of help from our colonial government.”7 The “colonial” help provided by the Government of Canada for Canadian literature was distributed to writers, as well as to publishers of small presses and little magazines. Organizers of poetry readings received tenuous funding beginning in 1959, support that cultural agents fought to stabilize during the ensuing decade before it became firmly established in the offices of the Council by 1970. Canada Council support was not universally adopted by cultural agents in the fields of Canadian literature. Butling points to the magazines NMFG (No Money From the Government) and filling Station [sic], as well as the 1980s small press scene in Toronto, as examples of independent Marxist positions relative to Council grants.12 Oppositional positions of this sort are rooted in resistance to the “market-oriented, corporate ideology”13 that forms the basis of the rules of applying for and receiving funding. Frank Davey’s critical examination of the material-economic specifics of Council funding dissects the influence of the “block-grant” program, including its role in defining what constitutes a book. To qualify, books must be a minimum of 48-pages, placing funding out-of-reach for shorter titles and “privileging […] the 100–200 page novel as the standard of English-Canadian publishers,”14 thus directly influencing what is and is not published in Canada. Other critics confront problems of jury bias, wherein “the so-called ‘peer’ juries were, for many years, almost exclusively composed of mainstream subjects”,15 consigning marginal subjects to more difficult struggles to acquire support. The relationship of literary readings to the Canada Council is a productive, yet largely unexplored, component of this body of forces. Darren Wershler, following from Barbara Godard’s charge to include the critical study of cultural policy within literary studies, signals one way that the study of literary readings can both illuminate and be illuminated by critical engagement with cultural policy: “[Godard gestures] toward an equal but opposite imperative – the need to look outside the text at the assemblages of discourse, power, material media forms and systems of circulation that allow particular statements to come into being at a particular time and place, and imbue them with significance.”16 Literary readings are particularly suited to this practice because they already exist fundamentally “outside” the text as it is typically conceived and studied. The emphasis of a public reading does not fall on the printed page, but rather on public utterance. Literary readings were anomalous in Canada in the 1950s, staging an alternative material manifestation of literature, circulating human bodies as opposed to printed texts. The novelty of public readings rendered them open to experiment. As the model for funding readings developed throughout the 1960s and early 1970s, structures became fixed, widely adopted, and normalized, due in large part to the availability of funding and the necessity to apply for such funding in regulated patterns. In our current critical moment, poetry readings furnish the opportunity to study literary production, dissemination, and communities in novel ways due to this characteristic of being “outside” the text. Wershler calls for scholarship that treats art “not as a conduit, but as a kind of critique at the limits of what cultural policy (critical and uncritical alike) will currently allow itself to think.”17 As literary readings did not exist as a category at the offices of the Canada Council in 1957, they therefore performed this function. An attentive examination of the funding of readings in these years will reveal cultural policy in the act of “allowing itself to think” in slightly wider terms. In the activities of the Canada Council and the poets who lobbied for funding, we can observe an alternative model of cultural funding that was initially adaptable and responsive to the needs of cultural agents. The table below organizes information gathered from the Council’s published Annual Reports to illustrate the staggering rate of growth in both the number of literary readings (and organizations) and the funding made available by the Council during the first two decades of its operation. This table does not, and cannot, reflect the complete network of poetry readings and organizations that flourished during these decades. The emphasis of this table follows from the emphasis of this paper on the role of the Canada Council in funding a particular type of poetry reading. Unaccounted for here are series that submitted failed applications, series that missed deadlines, series that were unaware of the availability of such funding, as well as series that were not interested in applying for funding (whether because it was not required or because of a politically motivated opposition to the Canada Council). 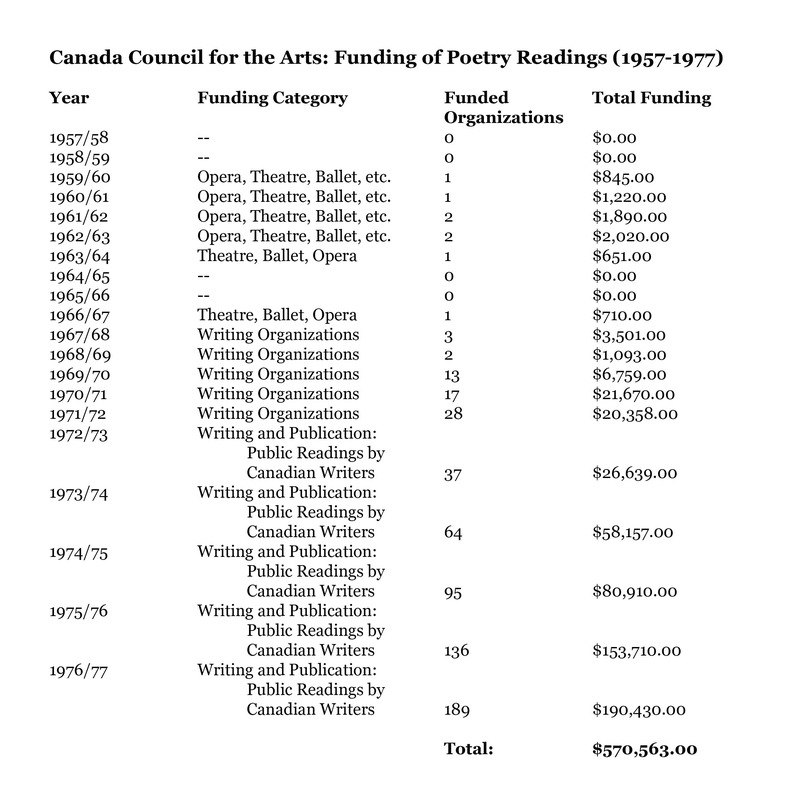 Image 1: Canada Council Funding for Poetry Readings (1957-1977). In 1959, the Council funded a poetry reading series for the first time. 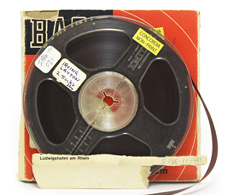 The Contact Poetry Readings received $845.00 to “provide travel and assistance to Canadian poets to present readings of their own work at the Isaacs Gallery, Toronto.”18 The Contact Poetry Readings ran from 1957–1962. Raymond Souster was the primary force behind the series, but was aided by others, including Kenneth McRobbie, John Robert Colombo, Peter Miller, and Avrom Isaacs. Initially, organizers drew on poets in Montreal and Toronto due to financial limitations. However, Canada Council grants received in 1959,1960 and 1961 enabled the series to present a list of emerging and established poets from across Canada and the United States.19 The Contact Readings established a creatively successful Canadian precedent for poetry reading series, while simultaneously drawing Canadian poetry into a broader international dialogue with similarly focused modernist and early postmodernist communities. I know very well that you make grants to groups—as well as to individuals. I know that you assisted drama groups, small orchestras, a variety of other endeavours in no way more deserving than those whose interests I have at heart. I know also that several times I have read pronouncements by your committee that you are looking for projects which have already proved their worth in practical operation. At this stage, the Canada Council begins to act in ways that are sensitive and responsive to the specific needs and goals of the Contact Poetry Readings, revealing a template for cultural funding and cultural policy that was able to evolve in the Council’s early days due to the relatively small scale of its operation. Poetry readings were not yet visible to the Canada Council in 1957 when it was founded; it had no category under which to fund such events. Nevertheless, and to the Council’s credit, it endeavoured to find a way to support the fledgling Toronto series. Poets were given a $25.00 reading fee, as well as contributions to travel and accommodations. The novelty of this grant is made plain by the fact of it having been given under the category “Opera, Theatre, Ballet, etc.,” alongside grants made to the Canadian Opera Company and the National Ballet Guild of Canada. The size of the readings, while a partial concern initially, was also likely an encouragement to the Council to fund the series as the grant was a relatively small investment compared to others that were being granted in the same category. For example, the $845.00 given to the Contact Readings constitutes less than 1% of the $100,000.00 given to the National Ballet Guild. The Contact Readings received further grants of $1220.00 in 1960/61 and $1290.00 in 1961/62. However, there is another thread that can be traced in the findings of the report that argues in favour of the necessity of engaging Canadian cultural life with international influences. The report states, “the literature of the United States, which in the last thirty years has acquired an increasing international reputation, exercises an impact which is beneficial in many respects no doubt, but which, at the same time, may be almost overpowering.”38 Moreover, in its official recommendation that “a body be created known as the Canada Council,”39 the report emphasizes that one role of this new body will be to “foster Canada’s cultural relations abroad.”40 While the Council in many respects was established as, and continues to exist as, the “centripetal, homogenizing” force described by Pauline Butling, an alternative was always present in its foundational structures. Robert Lecker identifies the mandate of the Council as a “federalist and culturally elitist ideology”41 directed toward the goal of “stabilizing nationhood”42 that nonetheless “embraced the new, the innovative, the unconventional, and the regional”43 despite the implicit subversive challenges these activities posed to the ideal of a coherent national identity. Lecker argues that supporting such activities “was intended to demonstrate that federalism could encompass – and still does encompass – difference.”44 Such broad terms, however, obscure the actions of individuals engaged in the Council’s day-to-day decision making, especially in its earliest days, before procedures had been developed, let alone become fixed and routine. Without question, Peter Dwyer, A.W. Trueman, and other early administrators operated within a federalist mandate, but one that did not restrict their ability to fund experimental work they believed was deserving of financial support, however minimal. Dwyer engaged directly with poets and audience members, soliciting opinions on the value of such activities (including the funding of American readers) before deciding that the Council should “experiment” by funding them. Despite the initial grant to the Contact Readings in 1959, funding of poetry readings proceeded irregularly for several years. 1962 is notable for marking the first time that the Council funded two different sets of readings, the second at Le Hibou in Ottawa. In 1962/63 organizations in Edmonton and Vancouver received funding. The Montreal Museum of Fine Arts received funding for poetry readings in 1963/64. The following two years saw no organizations receive funding (it is unclear whether this was due to lack of applications or to the quality of applications received). The Poetry Series at Sir George Williams appears in the Canada Council Annual Reports for the first time in 1966/1967, and received the only grant given out that year. Readings continued to be funded under “Opera, Theatre, Ballet, etc.” (renamed “Theatre, Ballet, Opera” in 1963/64) until 1967/68. At this point, funding for poetry readings was subsumed under the general body of grants made to “Writing Organizations.” In 1972/73, a new funding category was created to manage the rapid rise in grants that the Council was making to poetry readings across the country: “Public Readings by Canadian Writers.” The emphasis of this new category falls clearly on “Canadian,” clarifying and restricting how federal arts funding could be spent. Between 1957 and 1977, the Canada Council awarded $570,563.00 to facilitate literary readings across Canada.47 The intervention of the federal government in the development of the Arts following the Massey Commission and the creation of the Canada Council after the Second World War have been the subject of much scholarly and artistic criticism. The implications and stakes of the use of funding that is granted and spent in a framework as explicitly nationalist as the Canada Council is a necessary site of investigation. However, this ongoing analysis requires material historical grounding. An investment of $570,563.00 in poetry readings over twenty years is significant and is responsible for making at least some measurable headway in combating the geographical isolation endemic to the experience of Canadian writers in the middle decades of the previous century. Canada Council funding played a substantial role in facilitating the growth of poetry readings while simultaneously fostering the work of small presses and little magazines. However problematic this funding is, a significant portion of the literary exchange of these decades was only possible in the form that it eventually took because of the influx of Council money. Institutions like the Canada Council and university English departments hierarchize knowledge and culture by privileging certain forms of production by way of grants and study. Funding one practice encourages others to apply for similar funding, thus establishing precedents and contributing to the evolution of the habitus of the cultural field. Canadian Literature emerges in the 1960s and 1970s as a visible cultural formation alongside its establishment as a viable academic discipline. The Canada Council was central to both of these processes, supporting artistic and scholarly work. By looking closely at one site among the diverse concurrent processes, one can discern a moment of growth and development in the emergence of the poetry reading as a new form of literary expression that the Canada Council recognized, as well as the mechanics of cultural policy that gradually shape such a new form into a more fixed and controlled cultural process. This paper has traced one dimension of the ever-changing historical conceptions of the “literary” in Canada in the twentieth century by documenting the specific material economic conditions that facilitated the widespread establishment of public readings as a form of literary expression. This study also returns some humanity to institutions more often written off as unthinking bureaucracies by focusing on individual decision-makers and their interactions with cultural agents. While the funding of poetry readings would grow increasingly bureaucratic by 1977 as they became more widespread and funding categories became established, the earliest manifestations in 1959, 1960, and 1961 offer a model of cultural funding and policy that, due to its small scale and relatively small financial stakes, was able to respond directly and personally to the needs of artists and other cultural agents. It displays a form of thoughtful, engaged, and responsible cultural policy development, the results of which can be measured and evaluated, in part, in material terms. Given sufficient time and financial resources, one could trace who travelled where and when across Canada during these decades in order to map what was accomplished with the Council’s investment. Such a mapping would show the circulation of bodies that followed from Canada Council funding to form part of the “complex discursive assemblage” of poetry readings.48 Poetry readings require the movement of human bodies and as such require greater financial investment than the movement of books and literary magazines. Readings, unless hyper-local, necessarily consume more resources than these other, previously more common forms of literary expression. The Council enabled the circulation of hundreds, if not thousands, of human bodies in these years to read poetry out loud. Regardless of the valid criticisms that have been regularly levelled at the Council since its inception, this funding was vital in establishing poetry readings as important forms of expression in Canadian literary fields. 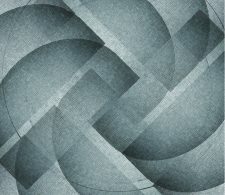 Article: Creative Commons Attribution-NonCommercial-ShareAlike 3.0 Unported License.